Quality has no limit, and when you have a big budget for something, you can expect to have products that will make your life so very comfortable and enjoyable. Here we list out some of the luxury and best high-end camping tents with an unlimited number of features. You can build camping resorts middle of the forest or camping area using these best camping tents. So, if you are looking to have best out of your next camping, grab one of one of the following high-end camping tents. This is a famous and best six person tent for luxury camping outing. If your camping includes less than six persons, you might go for this one. This is a high-quality tent with so many features to keep you protected from the unfavorable weather. Its key features include Floor area of 10 by 10 feet, total package weight of 68 pounds, maximum ceiling height 6 feet 6 inches, 3/8-inch solid spring steel Flex-Bow rods, 1-inch galvanized steel tubing, 16-ounce polyester-reinforced vinyl with welded seams, 8.5-ounce Hydra-Shield canvas as wall material, and 10-ounce Hydra-Shield canvas as ceiling material. This rugged, all-season tent has a limited lifetime warranty. It is a versatile tent, so you can expect to use it for any camping or occasion that involves less than six people. The silicone finish and tight weave make the tent watertight but breathable. So, no water will link inside if you carefully set up the tent. Its large front and back doors, four big windows and two vents at the top ensure proper ventilation inside the tent. This might seem a little too expensive for a six-person tent, but its quality deserves the price. So, a high price for the high-quality product is a fair deal. 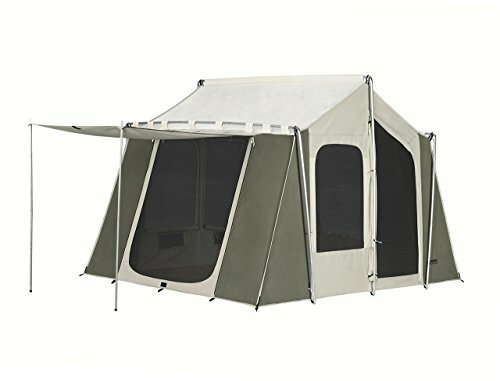 If you have liked the previous one, but you need a bigger tent with similar features, don’t worry. 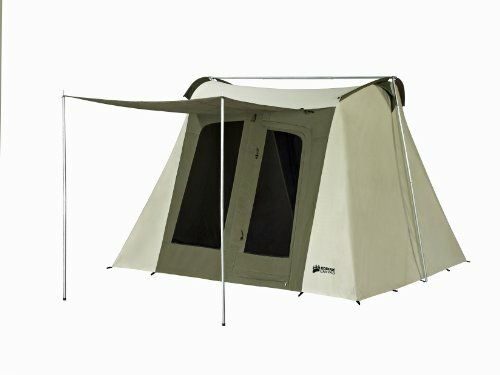 This Kodiak Canvas Flex-Bow Deluxe tent can accommodate eight persons, but you have to pay just $25 more. Its difference in specifications from the previous one include 85 pounds of shipping weight and 10 feet by 14 feet of dimensions, giving you lot of space inside. So, you get more room and more opportunity to move comfortably inside the tent allowing more people to sleep inside the tent. And you get all the top quality materials. 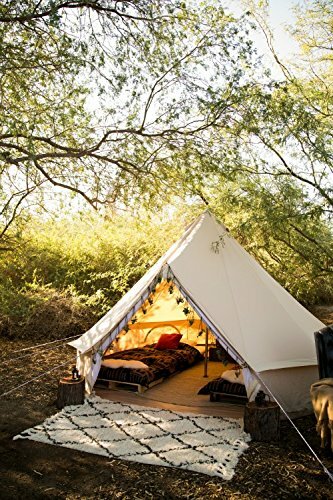 Even after being one of the most expensive tents on Amazon, it is highly rated among the real buyers. This feature-rich tent comes with best quality mesh screen door and 4 windows to the best view of the nearby area and perfect ventilation inside. Its durable pro-metal sliders serve tensioners on your guylines. The most likable feature of this 100% cotton tent is its stove jack which is sized to meet industry standards. It is professionally installed to protect the integrity of your canvas. Its zip in/out groundsheet gives you the ultimate freedom to roll up the walls of the tent and avail maximum ventilation. 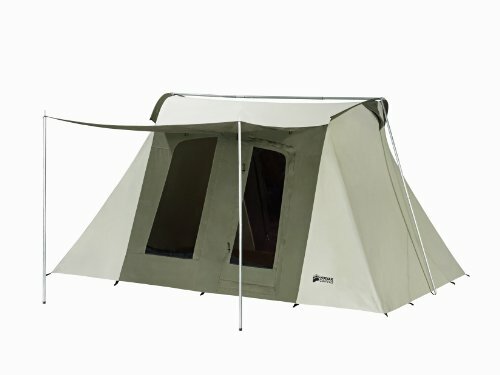 The tent is currently available in two sizes. Its 100% 5-star reviews and excellent words left by real buyers talk a lot about its quality. Highly recommended. This one is a very spacious tent with all the features you need to make your camping experience a luxurious one. Dream House has a few different variations of the similar tent. So, the difference is just the size. 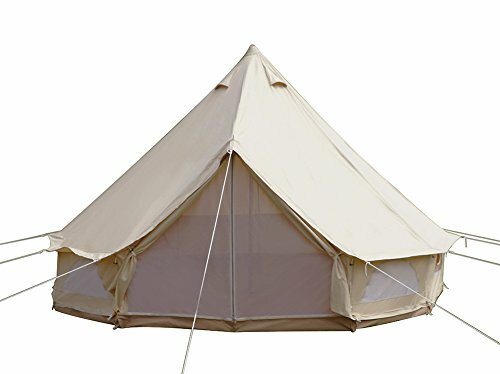 The key features of this luxury family camping tent include waterproof and mold resistant0.63 lbs/10ft2 cotton canvas, diameter of 16.4ft, galvanized steel tubes and door poles, an integrated, heavy-duty zippable groundsheet, PVC made groundsheet, fabulous sand-like beige color, and mosquito screens equipped doors (2 doors) and windows (4 windows). You can easily accommodate two queen-sized beds inside the tent. So, you, your spouse and up to eight kids can sleep on those beds. The doors are zipped to allow you easy and fast access. The tent is highly weather resistant, and you can expect to remain completely safe even in very windy condition. But the tent is not perfect for the heavy rainy weather. The tent comes with four years warranty for steel part and two years warranty for canvas part. If this tent seems a little too bigger for your needs, consider 4m diameter variation of the same tent with a similar look and all other features. Do you like biking during the camping?, why don’t you check this great collection BMX bikes sale online. This one is a very spacious tent with all the features you need to make your camping experience a luxurious one. Coming up the nest and one of the unique tents on our list is from Northwest enterprises. Northwest enterprises primarily deal with home-related products like table cloth, tote bags, steering wheel cover, and premium tents. This tent is made for the approximately 10 persons and is wide enough to accommodate your belongings. It is around 20 ft long 10 ft wide and has approximately 7.2 feet height so that the majority of users can stand comfortably. It has a large porch where campers can sit comfortably and enjoy nature. The floor of the porch is detachable so that you can take it out and can use it to seat outdoor. Also, it comes with room divider and rear door to add extra privacy to the camper. It looks and feels like a house and easy to set up with specially designed color codes. It is equipped with chain-corded poles made using the steel. The fabric of the tent has everdry coating to keep it dry. It is divided into two rooms and has 6 windows for proper ventilation. Windows are covered with mesh to avoid bugs and mosquitos entering the room. One more interesting feature of this tent is that it comes with two hanging shelves and wall organizers to keep your camping tools organized. When you are done with your camping adventure you can pack the tent in a bag which has wheels for effortless handling. If you are looking for an affordable yet sturdy and spacious high-end tent, then this Coleman Elite WeatherMaster Tent is a perfect option. Made of imported polyester taffeta 75D, it is 6 ft. 8 in. in center height. It is 11 x 9 ft. with 9 x 6 ft. screen room. So, the measurement is perfect for 6 adults. You can expect to have perfect protection from sunlight as the tent comes with WeatherTec System. Its welded floors and inverted seams help keep water out. Apart from these, its screen room offers you bug-free lounging. Its steel poles make it sturdy as well. One of its most likable features is its illuminated wall switch that lets you select between low, high and nightlight modes without getting up. Even after being a large luxury tent, it weighs just 42.31 pounds. Overall, this multi-colored tent is a perfect luxury tent in very affordable price. 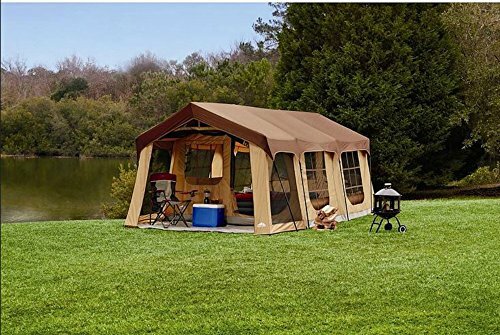 If you are looking for a stylish, rugged and versatile luxury camping tent, this canvas cabin tent is a cool option with so many wonderful features. Made with Hydra-Shield, premium grade, and 100% cotton, this camping tent offers plenty of ventilation inside as it comes with a large front door and a side entry with a quality zipper. Its large side windows too contribute to perfect ventilation. Its no-see-um screen mesh ensures there is no bug inside the tent. Its silicone finish and tight weave make it watertight. It also makes sure there is no mugginess and condensation inside. Another important feature of the tent is its puncture resistant, heavy-duty and seamless, 16 oz vinyl floor that keeps water out. The ceiling is 7.5 ft. which is perfect for campers of any height. Setting up the tent is a little work as it requires at least a couple of people to do it. Its 100% live five-star reviews and wonderful comments left by real customers talk a lot about the quality. It worth every Penney. We highly recommend it. NTK is known for a valuable product range that includes the sport camping tents. They are in the business for more than 43 years and captured the market share in almost 27 countries. NTK Arizona sport camping tent is one of the best rated camping tents for the family. It is a spacious, strongly built and easy to assemble tent for camping lovers. 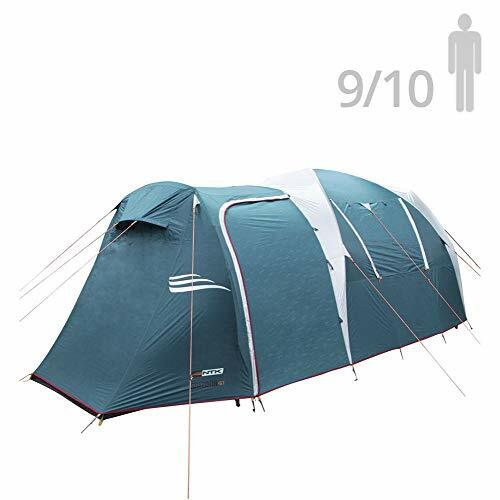 Though the price seems a bit high, it provides space for almost 8 to 10 people which reduce the cost of buying multiple tents to occupy 10 people. Made with a double layer of 190T polyester fabrics which is laminated with the 2500mm polyurethane water column to avoid water leak and has large D-styled doors protected using mesh to aid proper ventilation and avoid mosquitos. Mesh is also a no-see type to keep the privacy intact. Pin and ring system are made from Aluminium and useful for quick setup. The floor of this tent is made from the heavy duty anti-fungus polyethylene material and is constructed like a bathtub with silver coating on the inner side. One of the benefits of owning the NTK Arizona GT sport camping tent is they come with a lifetime replacement warranty for the poles as they used the fiberglass material which is NTK designed in their lab. These tents are available in various size, ranging from 8 to 9 people to the 12 people accommodation tents are available. CORE is one of the few companies that are totally dedicated to bringing the best products for campers. They exclusively deal in tents, chairs, sleeping bags, and shelters. CORE 6 person dome tents also come with the quality and as the name suggests it has enough space for 6 people. This is a great camping tent which is easy to set up and made from polyester fabrics. The tent has solid built and enough space for several people. 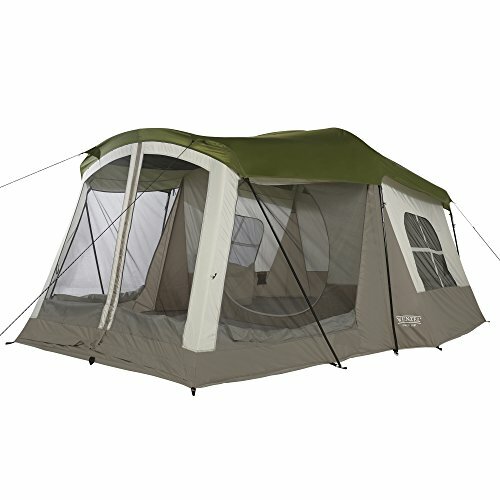 It also comes with 72 inches center hight which allow a person to move freely within a tent. Core has come up with an uniques H2O black technology that prevents water leak and ground vents are adjustable. The tent has few hooks where you can put lantern and other stuff to avoid keeping them on the ground. 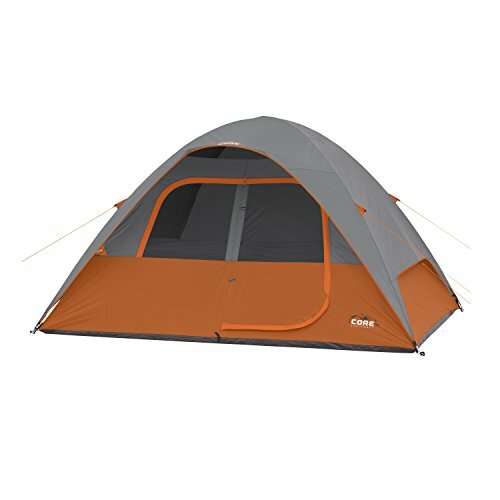 Along with the tent, CORE provides carry bag, tent stakes, and rain fly as well as provides the 1 years limited warranty. The zip of the main door of the tent has rain-resistant flaps to avoid leaking of water during rain. It is a great feature to have but it also makes it impossible to zip the door with one hand, every time you zip or unzip the door you will need to use both had which might turn off some users. Otherwise, it is a great tent to buy and fits perfectly in the carry bag and easy to carry around during the camping adventure. Also, at such a low price with solid build this a perfect pick for customers who are after the affordable camping tents. If you are looking for a portable camping cabin that is spacious and easy to assemble by a single person then Wenzel 8 person Klondike tent is your go-to product. It is a well-designed tent and has some awesome features like tent porch which allow you to stay in a tent and enjoy the breeze without exposing yourself to sun rays. It is an 8 person tent, ideal for family camping. Wenzel term it as a 3 season family camping tent and has enough space for 8 people as it measures 16 feet by 11 feet and has 98 feet of carpet space that allow 5 people to sleep and has 60 square foot screen room where three to four people can sleep. 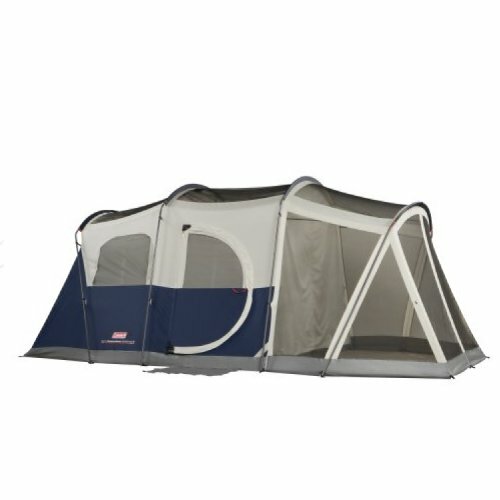 It comes with approximately 6.5 feet of headroom to allow campers to stand up and move freely in the tent. Roof and windows are equipped with the mesh to keep the bugs and insects out of the tent and an attached screen room can be utilized to store the camping ears or as a picnic room. Overall it is a good camping tent choice for family or group of 8 people. The only thing that few people might find difficult to deal with is that it is a heavy camping tent and difficult for backpacking. It also lacks a small hole where campers can pull an electric wire inside the tent but this can be overcome using the small portable charger. As compared to all the high-end camping tents we have reviewed here, this tent is much cheaper and has impressive features at an affordable cost. These are some very high quality and high-end camping tents that you can purchase if you want ultimate protection and comfortably in your camping and look to use the same tent for few consecutive years. Budget is a very important thing to consider every time you purchase something. But when you want the best of something you need to increase your budget. These are not some of the best-selling camping tents on Amazon because these are very expensive and only a particular kind of campers only looking for this much high-quality tent. So, if your requirement is not so high, you can look out for so many other tents with a decent number of features that can keep you safe and allow the level of weather protection you may need. They normally cost between $150 to $300. But if you go for any of the above-mentioned tents, be sure that you are going to have utmost protection and comfort in all seasons as most of these are all season tents. Hope these tents will meet your high-end camping tents requirement for luxury camping.